This list contains the Best Young Players from the La Liga 2013/14 season. Note that the players that qualify as ‘young’ are those that were 21 at the start of the 2013/14 season. The ex-Genk keeper has become one of the most sought after keepers in World football with his impressive performances. Belgium’s No.1 is currently with Atletico but is contracted to Chelsea who still seem to be unclear on his Premier League future. 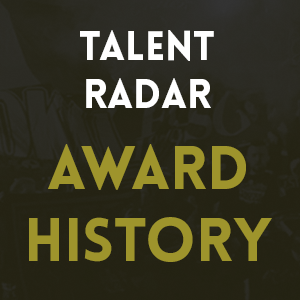 Thibaut Courtois won 3 individual awards and featured in 2 team awards at our inaugural #TalentRadar Young Player Awards. See all the winners here. It’s no doubt that Thibaut Courtois is guaranteed to be performing at the top level for years to come, given his experience this season with Atletico competing in both the La Liga and the Champions League. Diego Simeone’s men have lost just four times in the league while the youngster has managed 26 clean sheets in all competitions at club level this season, at the time of writing. He was in between the posts when Atletico got wins at the Bernabeu, against Barca in the Champions League and as they’ve remained unbeaten against the big two. Courtois appeared in our Talent Radar Team of the Week once, for his performance against Villarreal. The Frenchman is one of only two players from his country to play for the Basque club, and he draws similarities with his countryman – Bixente Lizarazu. Aymeric Laporte has arguably been one of the best defenders in the La Liga as Atheltic Bilbao have been looking to secure Champions League football. He proved to be a worthy replacement for Amorbeita who left for Fulham in the summer. Laporte has been part of a side that has gone from a bottom half finish to challenging for Europe’s elite competition. He has appeared in nearly all of Bilbao’s league games, except one, starting all those games as he formed a partnership with experienced captain, Carlos Gurpegi. 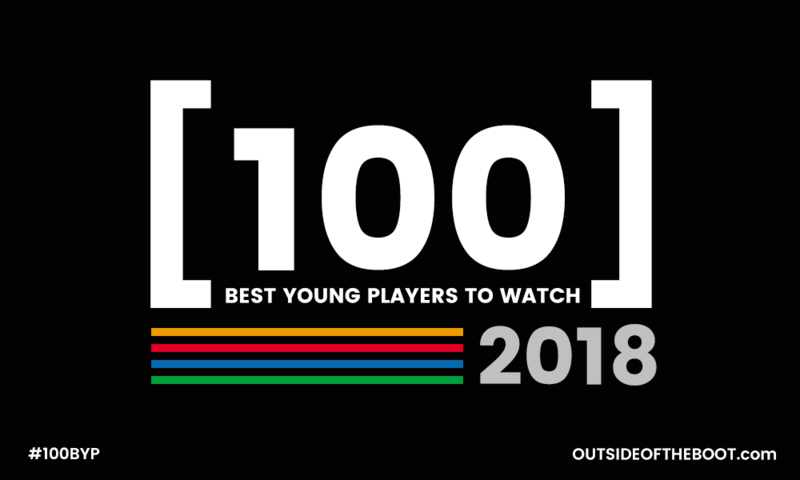 Laporte featured in our list of 100 Best Young Players to watch-out for in 2014, he was at #10 in our list of defenders. You can read a detailed Scout Report on Laporte here. He also featured in our Talent Radar Team of the Week for his performance against Sevilla. After spending a season in the Bundesliga with Leverkusen, Dani Carvajal has transitioned into Real Madrid’s side, clearly benefiting from the experience. Dani Carvajal won the #TalentRadar Readers’ Defender of the Season, as voted for by our readers at our inaugural #TalentRadar Young Player Awards. 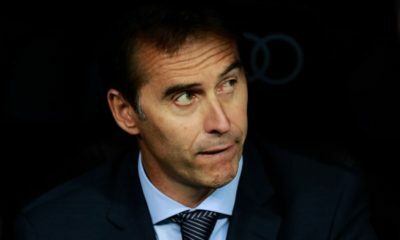 Carvajal has been subject to a lot of squad rotation as Real have competed in three different tournaments, reaching the final of two and taking the league race till the end. Carvajal, however, has retained his spot for majority of the game, as the side’s first choice right-back keeping Alvaro Arbeloa out of it. Dani Carvajal has been instrumental in helping his side out defensively with his positional intelligence and strength while also providing a good option in attack. Head this way for a detailed Scout Report on Dani Carvajal. Personally, Juan Bernat has been a favourite of mine in this season’s La Liga, with the exciting left-back having a breakthrough season with Valencia. The youngster has done well to add an attacking threat for Valencia, and can easily be mistaken for the man he has effectively replaced, Jordi Alba. 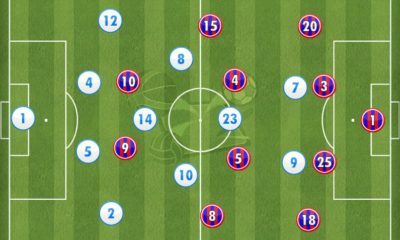 The two bear a similar style in the way they contribute to the side in an attacking capacity, with Bernat making regular runs down the channel in support. He is surprisingly good defensively as well, averaging 2 tackles and 2 interceptions per game. His pace has helped his game-play as well, as the attacking wing-back has been one of the better players for Valencia this season. Juan Bernat featured in our list of Best Young Players to Watch-out for in 2014, coming in at #8 in our list of defenders. View the entire list here. 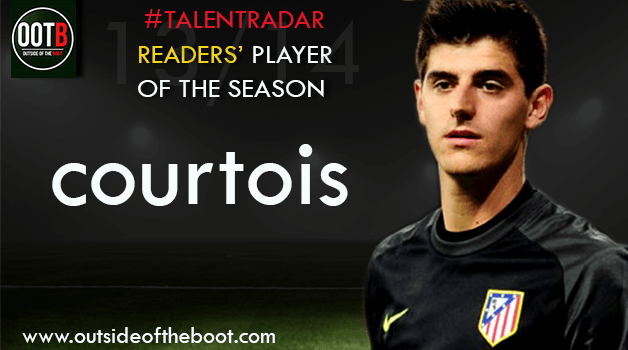 He also featured in our Talent Radar Team of the Week (see Courtois for link). Part of Atletico Madrid’s impressive side, Koke has been praised for his versatility, technical abilities and mature displays in the heart of the midfield in the La Liga. 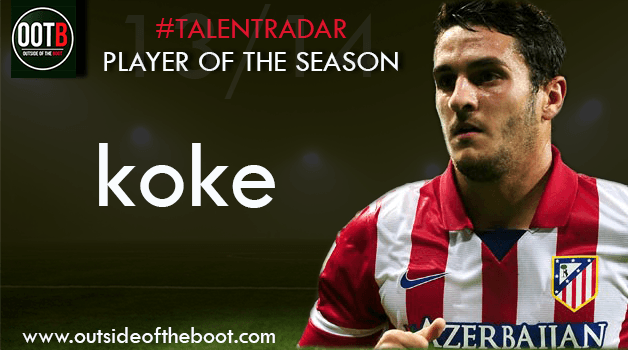 Koke won 2 individual awards and featured in both team awards, including the biggest prize of all, the #TalentRadar Player of the Season Award at our inaugural #TalentRadar Young Player Awards. 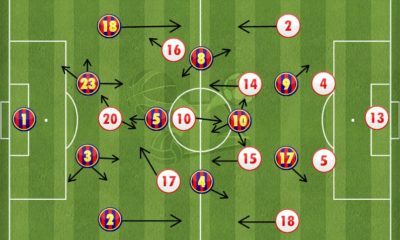 This win was published in Spanish newspaper, AS, as well. Comfortable playing anywhere in midfield, Koke has been instrumental in instilling Diego Simeone’s hard-working philosophy at Atletico Madrid. The youngster has been defensively solid while also not being afraid of venturing forward, making runs into the box in support. He has made 14 assists in the league, at the time of writing, putting him second in the table while also contributing his fair share of goals. He has developed into a reliable set-piece taker too, with some good deliveries. 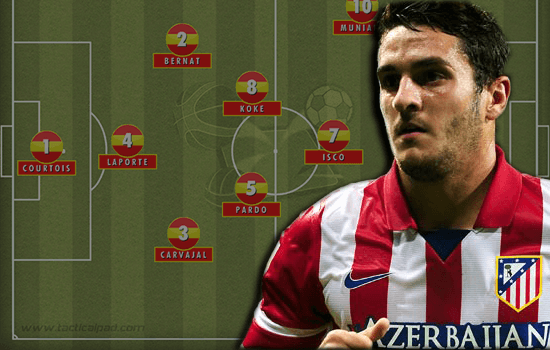 Koke has featured in our Talent Radar Team of the Week for his performance in the Madrid Derby. Here is a detailed Scout Report on the Atletico midfielder. With Asier Illaramendia’s sale in the summer, Real Sociedad had to ensure he could be adequately replaced in the side. Up-stepped Ruben Pardo who has played the crucial role excellently. 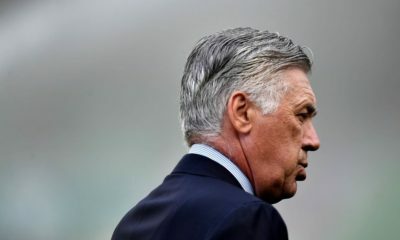 Ruben Pardo’s role can be best be described as the role Alonso plays at Real Madrid and his replacement Illarramendi, is expected to play, as he did at Sociedad. Sitting deep in midfield, he acts as the creative head for the side. The young midfielder has created 11 goals this season helping Sociedad’s European bid. He has also been impressive with his passing, managing a good 85%+ success rate according to WhoScored. This proved to be a successful breakthrough season for Pardo, and he can only grow from here. The man who wears Xabi Alonso’s shirt number at Sociedad, has also featured in our Talent Radar Team of the Week. Isco Alcaron is widely considered the brightest young Spanish talent, and Real Madrid’s coup of him from Malaga has proved to be a masterclass. The youngster has scored some beautiful goals for Real, and has further enchanced his attacking prowess. But under Ancelotti, Isco has developed his abilities as an overall footballer. 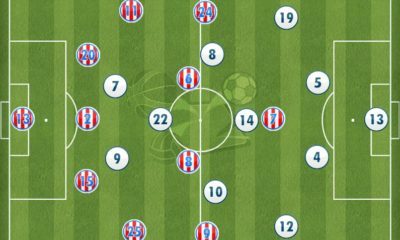 Real have had to be more disciplined and organised in midfield, without much attacking freedom. Isco has thus developed into an intelligent midfielder, showing a mature side to his game. The youngster has become a more complete midfielder this season, despite not playing as regularly as he would have liked. Head this way for a detailed Scout Report on Isco. Rafinha has always been touted as a potential at the Nou Camp, but was always going to find it hard to break into the side at a young age. He has proved his worth with his loan move to Celta Vigo. The young midfielder has largely played in an attacking capacity as he had led the club for much of the season. The La Masia graduate has been the focal point of most of Celta’s play with the club improving from a relegation battle last season to a comfortable top half finish this time around. 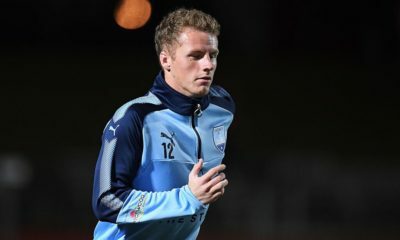 He has been the clubs standout player and although a first-team spot at Barcelona is unlikely, he certainly has made a good case for himself. Here is a detailed Scout Report on Rafinha Alcantara, he also featured in our list of 100 Best Young Players to Watch-Out for in 2014 coming in at #8 in our list of midfielders. 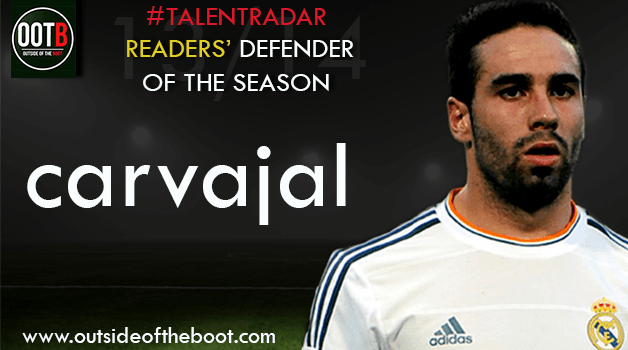 He featured in our Talent Radar Team of the Week for his performance against Getafe. Does Munian ever grow old? He has played over 200 times for his club, we’ve watched him for many years and he’s still only 21-year-old, and at the top of his game. 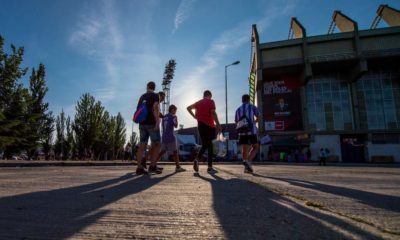 Although he has failed to find a certain level of consistency, Muniain has still been an integral part of Bilbao’s Champions League qualifying side. He has been a part of the starting eleven for majority of the games as Bilbao have done brilliantly under Valverde to turn around their fortunes after a dismal campaign last season. Relying on his pace, Muniain averages nearly 3 dribbles per game according to WhoScored; his intensity can be perceived from his 2.2 successful tackles per game. Munian featured in our Talent Radar Team of the Week for his performance against Champions League rivals, Sevilla (see Courtois above for link). Valencia’s young striker barely featured in the first half of the season, but took the league (and Europe) by storm in the second half, prompting us to take notice. From the start of the season to the turn of the year, Alcacer featured in just 5 league games, starting only two of those and scoring 0 goals. He did feature in the Europa League, scoring thrice in the group stage. But 2014 has been the year of Alcacer, his goals in the league combined with his excellent performances in Europe have made him the top scorer of the club, at just 20. A real ‘fox in the box’, Alcacer can be described as a no nonsense striker, taking the half chances that fall his way. Alcacer featured in our Talent Radar Team of the week for his performance vs Real Betis and also was in our Top 5 Young Players of the Month for February. Despite being only 21 at the start of the season, Neymar came with a lot of expectation as he was one of the most sought after players in pre-season. Barcelona have had a poor season thus far, and look to be ending up trophyless. Many have criticised Neymar as well and questioned his ability primarily due to the expectations that carry the heavy price tag. But Neymar is still in the early days of his professional career and has had a rather good season at the Nou Camp. Playing in a wide role in a front three, he has managed to display some of his skills that made both Spanish giants chase his signature. He has scored over 20 goals and 20 assists for club & country.